Deals Seeker: Don't Want to Pay Those High British Airways Fees When Redeeming Your Miles? Then, don't! Don't Want to Pay Those High British Airways Fees When Redeeming Your Miles? Then, don't! Are you all excited to use those British Airways Avios miles you've earned, on all those BA flights you've flown? Are you looking forward to an almost free reward flight? Well, when redeeming your reward miles on British Airways you have hefty tax and fuel surcharges that you have to pay in order to get your "free" ticket. The fees are so astronomical, that it just doesn't pay to fly British Airways, unless you redeem them for domestic travel within the US! Sometimes, BA is just so much more convenient that you just don't have a choice but to fly with them. I have a cousin that has racked up hundreds of thousands of these Avios points which are just sitting in his account and hasn't redeemed them because of the tax and fuel surcharges that are involved. Well cuz, do I have something to tell you! The Frugal Travel Guy wrote about a way to redeem those BA Avios miles using Iberia. So, this is what you do. Sign up for Iberia's frequent flyer program called Iberia Plus. Get some Avios into your account by using one of their partner offers. 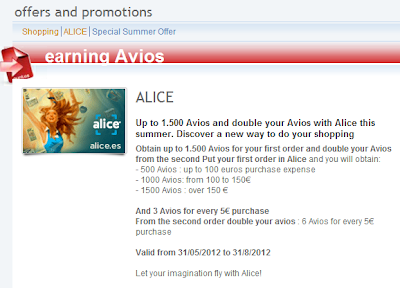 If you purchase something from Alice, their shopping mall you will earn Avios points. You earn 500 Avios for signing up to Iberia Plus. 1500 Avios for your first order at Alice and double your Avios with your second order at Alice, see here. Wait 3 months to be able to transfer your British Airways Avios Points to Iberia. Use your Iberia Avios Points from travel with low tax and fuel surcharges, enjoy! Do they have a frequent flyer program? Of course they do! The elite levels are Classic, Silver, Gold & Platinum. You may ask, well, where does Iberia and it's partners fly to? For the answer to this question and many more about Iberia, tune in to future posts.